Will the transliteration confusion never stop? No, it won’t, and apparently Passover will never end. 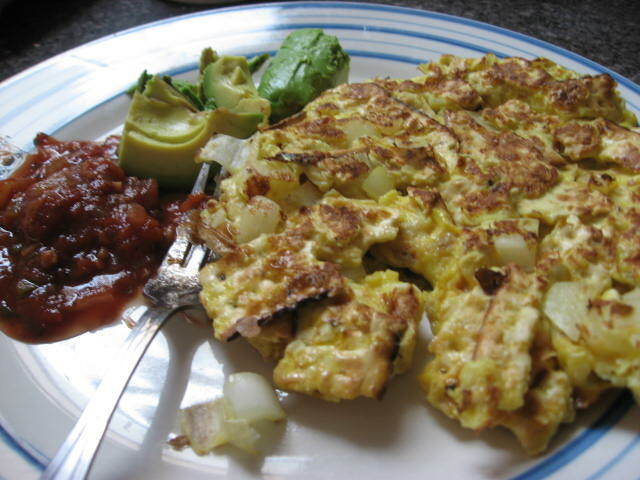 This morning, tired of plain matzoh grabbed on the run to work, I took the time to make a matzoh-centric brunch of matzoh brei, southwestern style, by which I mean served with avocado and salsa. This is a really easy recipe, either to get you through Passover, to use up leftover matzoh after Passover, or just as an actually really yummy breakfast. Matzoh brei is a take on French toast, basically. Instead of soaking stale bread in milk and egg and frying it, you soak matzoh (stale tasting enough on its own) in water or egg and fry it. But I’ve never really liked French toast, honestly, and I’ve also never been that into the typical sweet matzoh brei, served with maple syrup. Reading a recipe for savory matzoh brei a few years ago was like a revelation for me, and I love love love the results. Every Jewish mother has her own way of making matzoh brei, and, like a good Jewish mother in training, I have mine. Most people, it seems, run the matzoh under water to soften it (including Mark Bittman and Frank Gehry, as you can see in this totally strange and fascinating post, complete with video of the two discussing the art of the brei). I have never tried that, and I should before I knock it, but it just seems weird to me. Plus, I like the matzoh to still have a good amount of texture, which I think might go away if you run it under water. I make mine in true French toast style, and it’s never failed me. It’s funny — I’ve gotten so much luminous feedback on my matzoh crunch and this matzoh brei is so delicious. Makes me wonder, why do we not eat matzoh all year round? 1. Beat eggs in a small bowl with a fork. Add pinch of salt and freshly ground pepper. 2. Crush matzoh into pieces of varying sizes and mix into egg, covering well. Let sit for 10 minutes. Mix in onion. claire – great recipe. i made some brei tonight and definitely think you’re right about not soaking the matzoh first (poor frank gehry–first ratner puts miss brooklyn on hold, now this?). the only thing i would say is that i seasoned the bejeezus out of mine, especially cause i was short on salsa.